The third episode of The Walking Dead season 4 "Isolation" is one of those go between episode where not much significant happens. Rather the episode sets up the next episode or next few episodes as it continues the infection, traitor and murderer subplots. As the sickness that killed off Patrick spreads, a quarantine is put in place of the infected and the children are isolated. A small band led by show favorites Daryl and Michonne heads out for a veterinarian college to get antibiotics to fight off the illness. 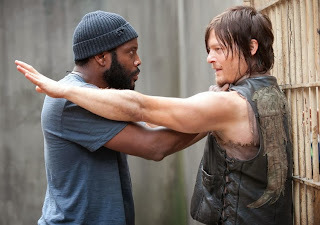 Rick pressured by Tyreese, goes back to his roots and investigate the murder and burning of David and Karen from the prior episode. He deduces the identity based on the size of the hand prints left at the crime scene. She doesn't deny the allegations when confronted which should make for some interesting moments next episode if Tyreese makes it back to the prison. Overall, I was not a big fan of this episode. 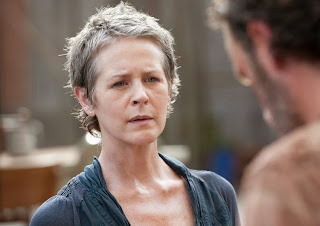 Melissa McBride who plays Carol does an amazing job as far as acting as you feel the grief that she feels. But the episode did nothing for me as far as advancing the story line. 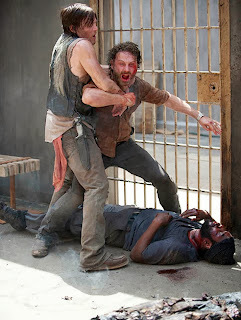 We see Tyreese and Rick having breakdowns in each their own manner. Still no Governor nor was the traitor subplot addressed in this episode. You can feel that Carol as well as Tyreese's days are numbered from this episode. Also surprisingly, Glenn is in danger as being one of the ones who has fallen ill from the sickness. In the comic books Glenn was able to survived way past the prison story line, so it'll be interesting to see if he'll be able to pull through.